PalmSHIELD cable railing is growing in popularity in new contemporary and modern architectural schemes. Designers like the look of this unique installation due to its slim and discreet appearance that leaves the eye to look beyond the railing. Others simply like the sleek look of the tight shiny stainless steel or galvanized cables. The challenge with cable railing is that it must meet standard IBC and UBC codes which requires an opening not greater than four inches and less than an inch of deflection under two hundred pounds of load. To meet this requirement the cables must be tensioned to some incredible levels, creating a considerable amount of pull on both ends of termination. PalmSHIELD announces their exclusive architectural cable design. This design is a real architectural wonder for cable railing. PalmSHIELD utilizes a single cable design where the cable is attached at the top of the panel and then strewn back and forth over a series of spools to a final and single tensioner at the bottom. This is a much more interesting and cleaner design than traditional cable railing. It has a real architectural look for those installations that require more than a simple cable railing. PalmSHIELD has been fabricating cable railing for almost twenty years. We know a thing or two about cable railing. We know that many cable rail installation fail over time due to the incredible amount of tension placed on the cable relative to the attachment of the termination posts. Imagine eleven cables, each tensioned to several hundreds of pounds of pull, pulling on one two inch square post screwed down to the top of a soft cedar deck board. If you are a cable rail installer; you are cringing a little bit right now because you know what is going to happen. System failure! PalmSHIELD uses our traditional fully framed panels. Each panel has its own independent cable infill not dependent on site post installations. Each cabled panel comes complete with fully installed cables. The panels and posts are predrilled, making installation simple and flawless. A traditional deck railing has at least four to five independent field installed cable runs. This installation would take several days between anchoring posts and installing almost one hundred tensioners. With the PalmSHIELD system, a traditional deck railing will take less than a day and no worries about failed posts. PalmSHIELD cable panels are designed to be accompanied with code compliant stair grab rails or handicap ramp rub rails. Stair sections are custom fabricated to account for stair landings. PalmSHIELD uses a cable stabilizer bar in the panels to support the cables along long runs. At changes in slope, a stabilizer bar will support the cables without the use of additional posts. PalmSHIELD has added a twist to our cable rail systems. We recognize that not all installations are level and predictable Our hinged system is field adjustable. 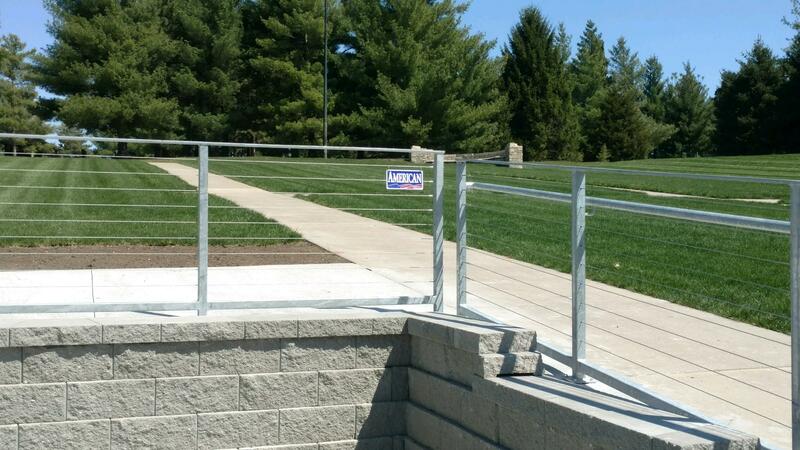 It utilizes a mechanical hinge connection at the top and bottom rail that allows the railing to adjust to changes in elevation and slope. 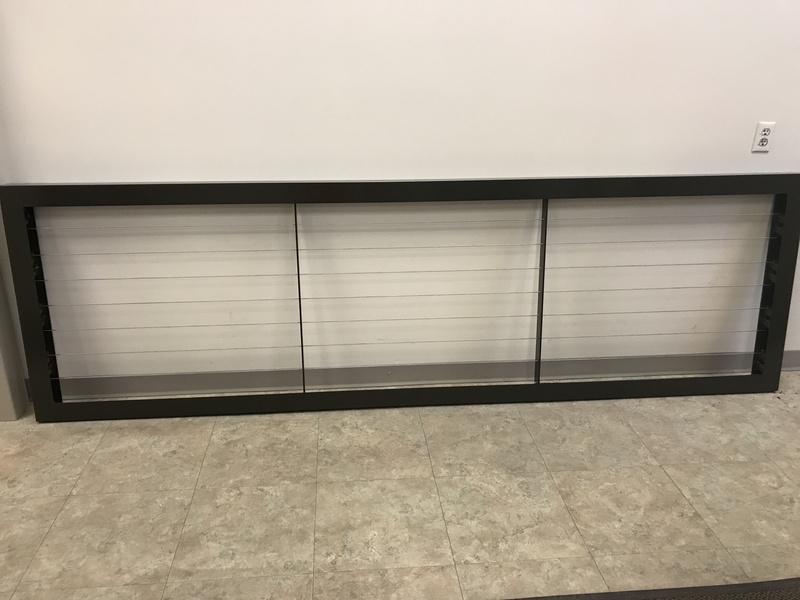 In-between each rail centered between the post is a hinged slim steel profile that keeps the cables aligned and assures the cables will meet code compliance yet is very discreet. 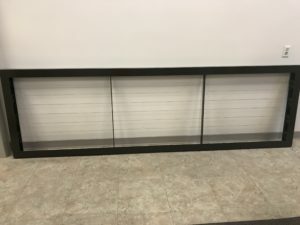 This unique one of a kind installation is perfect for large installations that may have varied slopes. Cable railing systems are tricky. The cables must be placed under considerable load to keep each one properly tensioned. With this level of tension, it makes it very difficult to manage any form of radius or long runs. This level of tension may damage the system structure or substructure. PalmSHIELD offers a very unique design where a single cable is threaded through a single panel to provide a full cabled panel with cables every 3 ½” on center. The panels are fully framed and cabled prior to shipping. Assembly is simple with no special tools or experience.